4WD. Van. Kei. Yellow. This has it all. When the apocalypse comes the most important thing to look for in a bug out vehicle is not what kind of navigation system a vehicle has, whether it has heated seats or even what 0-60 times are. No, what you want is something that A) gets good mileage and B) can take you wherever you need to go. As the name implies, this little gem will *carry* you to safety (see what I did there?). Yup, I made a pun on the name that they may have actually implied, thereby being totally obvious. And then called it out. Anyways....um, yes. 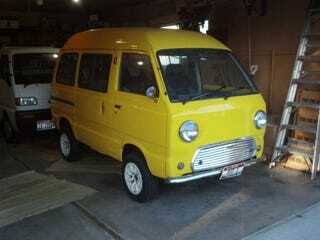 The Suzuki Carry. It is tiny. It is yellow. It is a freaking 4WD drive van. Okay, so it may not be a very LARGE van. It is a SMALL van. SM-all type of small. It has so much small that I wonder if a full grown adult could lay down in it. We'll go ahead and assume that yes, you can lay one one full grown adult on the left side of the van because, hey, this is right hand drive! Right hand drive will be extremely useful in the apocalypse. Why you ask? Well if I were hiding behind a boulder about to shoot at the driver of a tiny, yellow van that I saw driving through the wasteland, I'd aim where the driver seat SHOULD be. And you know what, I'd miss. We'll also assume, with nothing to back this up, that the 4WD on it is fantastic. So what say you? Is it worth 5K to be little, yellow and vanny?